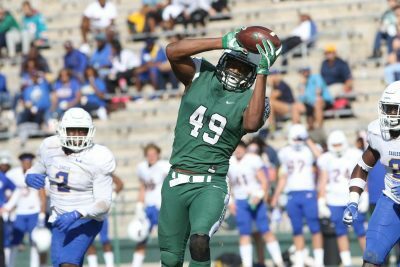 After some early drama on Saturday afternoon at Spec Martin Stadium, the Stetson Hatters allowed the 2,571 fans gathered to celebrate homecoming relax late in the game as the Hatters doubled up Morehead State, 48-24. Senior tight end Donald Parham caught nine passes for a career-high 187 yards. With the win, Stetson improves to 7-1 overall and 5-1 in Pioneer Football League play. It is just the fourth time in 55-seasons of football at Stetson for the Hatters to have won as many as seven games in a season. Morehead State fell to 3-6 overall, 2-4 in the PFL, with the loss. The win was Stetson’s fourth in a row and is the first victory by more than five points since the second week of the season. The early theatrics came deep in Stetson territory. The visiting Eagles, who were already leading 7-0 as the result of a 55-yard TD pass from Lawson Page to Chris Nelson, were knocking at the door again after intercepting a Colin McGovern pass. The pick, and 14-yard return by Sayyid Kanu, set Morehead State up at the Stetson 33. Three plays later, the Eagles had a first and goal at the Stetson four when Page tried to score through the middle of the Hatters’ defense. The combination of Regis Steighner and Colby Duncan made the stop and stripped the ball loose. Jalon Scott recovered for Stetson at the one to end the MSU threat. It took McGovern, who came within one yard of tying his own record for passing yards in a game, just two plays to make that turnover hurt. A three-yard run by Bryce Blackmon gave the Stetson offense some room, and then a 96-yard throw and catch from McGovern to junior Steven Burdette did the rest. Sophomore JJ Henderson, No. 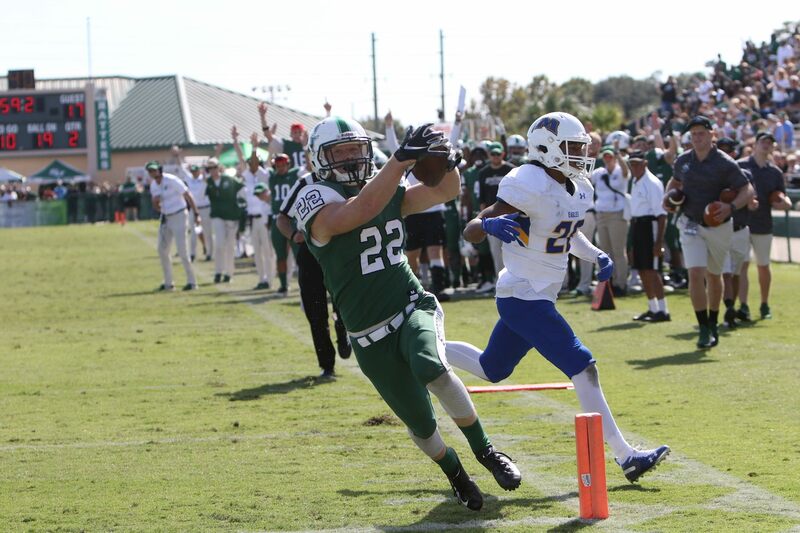 13, made an interception against Morehead State and ran 43 yards for a Stetson touchdown. McGovern, who did not play in the fourth quarter, finished with 390 yards passing on 19-of-35 attempts with four touchdown passes. Senior tight end Donald Parham caught nine passes for a career-high 187 yards, just four yards shy of the single game record, and two touchdowns, while Burdette caught four passes for 109 yards, with the one touchdown. Morehead State answered the Stetson touchdown with another scoring drive that covered 70 yards in just six plays with Page running in from 15 yards out for the score, but Stetson came right back to tie the game with an eight play, 76-yard drive that included solid running from freshman Jareem Westcott and ended with McGovern finding Parham for the score. Stetson had two more scoring drives in the second quarter, with Westcott capping the first on a 1-yard dive to put the Hatters on top to stay. The big play in that series was a 69-yard pass from McGovern to Parham. Morehead State drove for a field goal on its next possession, cutting the Stetson lead to 21-17, but the Hatters worked some two-minute magic, driving 74 yards in seven plays with McGovern finding senior running back Matt Taft for the 18-yard score. Senior running back Matt Taft takes it in for the Hatters. 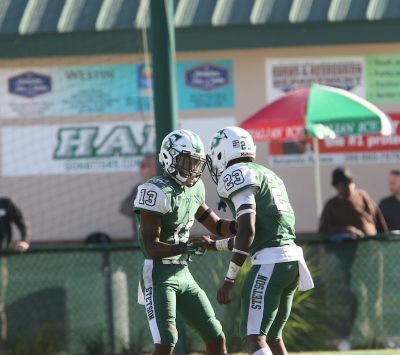 The Hatters basically put the game away early in the third quarter when sophomore JJ Henderson stepped in front of a Page pass and returned his first interception of the year 43-yards for a Stetson touchdown. With the help of Henderson’s defensive touchdown, the Hatters outscored the Eagles 21-0 in the third quarter, building the lead to 48-17. McGovern linked up with Parham on a 30-yard touchdown pass and Taft an 18-yard run with twenty-six seconds left in the quarter. Overall, Stetson finished with 575 yards of total offense in the game to 472 yards for the Eagles, who had 177 rushing yards and 295 through the air. With the win, Stetson remains undefeated at Spec Martin this season, improving to 5-0. The Hatters will travel to Indianapolis this weekend to take on Butler at noon. Stetson will close out its 2018 season at home against Valparaiso on Nov. 17, with kickoff set for 1 p.m. on Senior Day.